Researchers say an invasive beetle that's destroyed tens of millions of ash trees in the U.S. and Canada may have arrived in North America a decade before it first was detected. Michigan State University researchers collected cores from trunks of more than 1,000 ash trees in six southeastern Michigan counties. By studying them, they determined the year each tree was killed by the emerald ash borer and found trees killed as early as 1997. 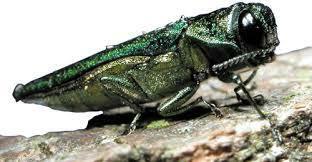 The ash borer was detected in southeast Michigan in 2002. The researchers say it would take several years before the beetle population was large enough to kill trees, so they concluded it had been in southeast Michigan since at least 1992 or 1993. The study is published in the journal Diversity and Distributions.